A show that took me absolutely no time at all to appreciate is Continuum. Its premise is tighter and more immediately appealing than Fringe’s. In 2077, the government is about to put a bunch of terrorists (think 9-11 style) to death when suddenly everything goes wrong — the terrorists time travel back to present-day Vancouver, taking the protagonist, agent Kiera Cameron (Rachel Nichols), back with them. Their plan is to better pull off their anarchist objectives so they don’t get caught and so they can wreak more havoc on the techno-oligarchy. So Kiera’s stuck in the past with dual objectives — to stop the terrorists, and to return to 2077 where she has a husband and son. The tension between those objectives pushes the narrative forward. With each successful thwarting of the terrorists’ plans, Kiera knows she’s likely changing the future, which means that even if she does somehow make it back to 2077, it might not look anything like the one she left. The writers exploit the time travel paradox to its fullest here, as Kiera could be undoing the future even as she attempts to save it. en higher as the terrorist movement continues to grow and as Kiera realizes what it means to be stranded in the past. While it’s pretty unbelievable that the Vancouver Police Department would overlook her rather lame “section six” explanation for why no one’s ever heard of her, it’s not hard to forgive that detail, especially as it eventually becomes a major challenge that threatens to derail her mission. Another initially difficult plot contrivance is the ability of a teenage computer genius, Alec, to pick up Kiera’s attempts at communicating with the City Protective Services. Through an experimental channel, he can watch, hear, and talk to her. This too is easy to get past, as Alec’s role in the present and future is clearly important, and he helps Kiera out of countless jams and is the only person who knows who she is and where/when she’s from. The technology itself contributes beautifully to the show, even when viewers have to suspend their disbelief a little. Kiera’s CMR (cellular memory review), a brain chip linked to her body suit as well as to a police database, allows her to simply look at a scene and register all kinds of important details, such as IDing fingerprints, blood types, and suspects’ stress levels. Watching her work, it’s not hard to imagine futuristic crime-fighting technology like this. 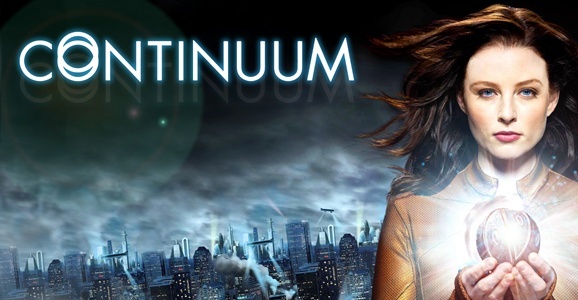 Continuum will start its third season sometime in 2014, which is a relief given how few good sci-fi shows are on right now. I’m a sucker for time-travel, so Continuum had me from the get-go, but I do find myself missing Walter Bishop when I watch.